The Faculty of Forestry of Bogor Agricultural University (IPB) in cooperation with Natural Conservation Advocacy Research Center and Advocacy Center, the Coordinating Ministry of Economic Affairs, and the Fund Management Agency of Palm Oil, organized the Focus Group Discussion (FGD) with theme "Sawit dan Deforestasi Hutan Tropika = Palm Oil and the Deforestation of Tropical Forest". This FGD was held at the IPB International Convention Center (IPB ICC), IPB Campus, Baranangsiang, Bogor, 12 April 2018. In this FGD there were many opinions regarding oil palm plantations and deforestation formulated. According to the Dean of the Faculty of Forestry, Dr. Ir. Rinekso Soekmadi, MSc, plantation commodity is one of the mainstay of national income and foreign exchange of Indonesia. According to the Directorate General of Plantations of the Ministry of Agriculture, the extent of oil palm plantations continues to increase from year to year. In 2016, the area reached 11, 9 million ha and in 2017 the total areas had increased into 12, 3 million ha. They are distributed in various areas of Indonesia, the largest is on the island of Sumatra about 7.4 million ha and Kalimantan about 4.3 million ha. "The forest itself is an ecosystem unit. An ecosystem is a group of living and non-living things that depend on each other to survive. The living things within an ecosystem are organisms like plants, animals, trees and insects that interact with each other as well as with the non-living things in the ecosystem, such as the weather, soil, sun, the climate and the surrounding atmosphere. They must be preserved. While oil palm plantations has the potential to generate significant economic and social development in Indonesia. Palm oil is Indonesia’s second most successful agricultural product, after rice paddy, and largest agricultural export. Currently there are concerns stigmatizing the whole plant when it is not the plants that are the problem, but where we plant it," he said. Meanwhile, Coach of Center for Advocacy and Nature Conservation Study who is also the faculty member of the Faculty of Forestry of IPB, Prof. Dr. Yanto Santoso, stated that this formulation recommended by FGD would be submitted to the government as important formula for government, entrepreneurs, researchers, non-government organizations (NGOs) and other stakeholders in safeguarding and guarding the development of Indonesia's environmentally sustainable palm oil plantations. "The prevailing Indonesian forestry laws, stated that the deforestation is the transfer of function or change of function from forest area into non-forest allocation. But deforestation, clearance, or clearing is the removal of a forest or stand of trees where the land is thereafter converted to a non-forest use. From the survey results to the field, I strongly convinced that oil palm is not the cause of deforestation in Indonesia. The oil palm plantations in Indonesia do not the conversion of forest areas, "he said. In addition, the Deputy for Food and Agriculture Coordination Ministry of Economic Affairs RI, Dr.Ir. Wistra Danny said Indonesia palm oil continues to grow rapidly and become one of the strategic commodities in supporting the national economy. The existence of palm oil plantation industry which is accompanied by various derivative products, must be acknowledged is still the main superiority of Indonesian commodity products. "Indonesia's oil palm plantation and processing industry is a key industry to the country's economy: the export of palm oil is an important foreign exchange earner while the industry provides employment opportunities to millions of Indonesians. Until 2017, Indonesia is still listed as the world's largest exporter of the commodity. Based on data from Indonesian Palm Oil Entrepreneurs Association (GAPKI). Oil palm plantations may not cause the most harm to biodiversity or tropical deforestation, or the decline of biodiversity and of forest fires. Instead oil palm is a promoter of natural conservation, that provide high conservation value for forests, which always provide benefits for life, "he said. 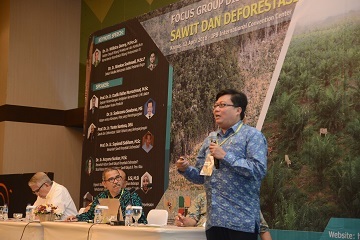 Recommendations as the result the FGD discussions, as well as the suggestions and solutions should be immediately drafted as academic manuscripts proposal as the basis to consider that oil palm plantation classified as the forestry crops. So it is possible cultivate palm oils in the area of Community Plantation Forest (HTR) and Industrial Plantation Forest (HTI). In accordance with the micro spatial arrangement of plantations, this palm oil plantation is a mosaic landscape with other plant species. The Indonesian government must step up and take deforestation seriously against deforestation actors and those who systematically cause deforestation issues without accurate and valid data. The government also must take the courage of all relevant stakeholders to legally prosecute those who systematically disseminate deforestation issues without accurate and valid data. They concluded that oil palm plantations are strategic crops in sustaining the well-managed and wise life of the community. Decades of mismanagement and plunder of Indonesia's forests have resulted in rapid deforestation and escalating levels of conflict and violence between local resource users and external actors from government. Therefore, palms are not entirely the cause of deforestation because most of the oil palm plantations occupy degraded forests. While more farmers convert their lands into oil palm plantations because palm oil is the world’s highest yielding oil crop, with an output 5–10 times greater per hectare than other leading vegetable oils. "So in the future of if palm oil garden will be maintained, they must be developed properly and must be based on landscape," said Dr. Rinekso.